[PDF] 7 Keys to Comprehension: How to Help Your Kids Read It and Get It! | Free eBooks Download - EBOOKEE! [PDF] 7 Keys to Comprehension: How to Help Your Kids Read It and Get It! Description: It's simple: If children don't understand what they read, they will never embrace reading. And that limits what they can learn while in school. This fact frightens parents, worries teachers, and ultimately hurts children. 7 Keys to Comprehension is the result of cutting-edge research. It gives parents and teachersâ€”those who aren't already using this valuable programâ€”practical, thoughtful advice about the seven simple thinking strategies that proficient readers use: â€¢ Connecting reading to their background knowledge â€¢ Creating sensory images â€¢ Asking questions â€¢ Drawing inferences â€¢ Determining what's important â€¢ Synthesizing ideas â€¢ Solving problems Easily understood, easily applied, and proven successful, this essential educational tool helps parents and teachers to turn reading into a fun and rewarding adventure. 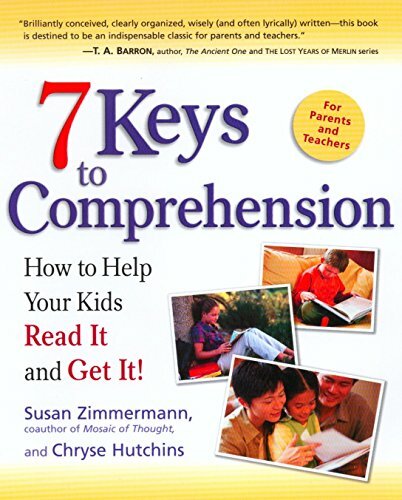 No comments for "[PDF] 7 Keys to Comprehension: How to Help Your Kids Read It and Get It! ".